Mumbai: With over ₹ 7,500 crore worth of monthly inflows in an industry with assets worth ₹ 23 trillion, the Indian mutual fund industry seems like a juggernaut. It’s hard to imagine that the seeds of India’s ₹ 23 trillion mutual fund industry were planted over drinks and dinner in the lawns of a plush bungalow in Nungambakkam, Chennai. It was 1992. The Indian economy had just been opened up. The Narasimha Rao government allowed private sector into the mutual fund industry in its historic Union budget of 1991-92. Before this, all fund houses were sponsored by state-owned firms, with the Unit Trust of India being an overwhelming market leader. It was in this setting in Chennai, Vivek Reddy—who had just returned from the US after his education and a small stint in a consultancy firm —got together with his childhood friend Shyam Kothari and convinced him to open a mutual fund. Kothari came from an industrialist family that had owned a non-banking finance company called Investment Trust of India (ITI). Kothari agreed instantly. Just as they were laying the groundwork, John Francis Cogan Jr., who was the chief executive officer and president of Pioneer Group Inc. US, came visiting. The Pioneer Group wanted to enter the Indian mutual fund industry and was scouting for Indian partners. Cogan Jr met Reddy and Kothari at Kothari’s Nungambakkam home for a meeting that turned into a casual evening chat that went on till midnight. Cogan, who had come with his friend and fellow Harvard University classmate Jaskaran Teja, were taken in by Reddy and Kothari, both of whom had just turned 30. Cogan and Teja were in their 60s at the time. The deal, as they say, was done and Kothari Pioneer Asset Management Co. Ltd launched its first two schemes on 1 November 1993, just five days short of Reddy’s 31st birthday. 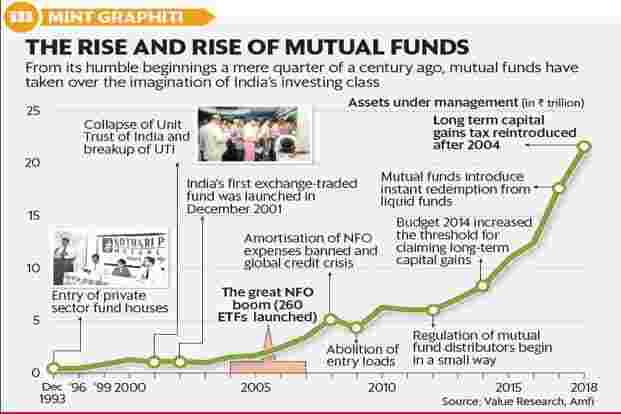 So, Kothari Pioneer Bluechip Fund and Kothari Pioneer Prima Fund were India’s first private sector mutual funds schemes. Reddy wanted to do things differently. Until then, fund houses used to disclose net asset values (NAV) once a month. Kothari Pioneer became the first fund to disclose the NAV daily. One Mumbai-based employee, Rajendra Mukadam, used to run to the BSE Ltd every day with a floppy disk, get the stock price data on it and rush back to office and send the file to Chennai for the team there to calculate the NAVs. “Sometimes the file transfer process used to take up to an hour because we used to have dial-up modems in those days," says Mukadam who now works as a senior sales manager at Franklin Templeton Asset Management (India) Ltd, the firm that acquired Kothari Pioneer AMC in 2002. Apart from promising—and delivering —redemptions within three days, Kothari Pioneer also gave account statements, instead of unit certificates that were popular in those days. Investors were both perplexed and surprised. “Investors used to be sceptical whether the account statements were any worth. They were used to glossy unit certificates with a seal embossed on them that made certificates looks authentic. But we said they could come to our office anytime and take a print out of account statements and those would work just as well," says Reddy over phone from Chennai. Reddy is no longer in the industry—he invests his own assets, and for a few of his friends, in a portfolio of stocks, funds and real estate holdings. Vashi, Navi Mumbai-based Krushna Finance, with assets worth around ₹ 900 crore and a monthly inflow through systematic investment plans (SIP) worth around ₹ 4 crore, is one of India’s largest mutual fund distributors today. In 1994, when the firm and its founder Sanjay Khatri were taking baby steps, the firm had a simple system. Khatri had just one office boy at the time, who would go to the offices of Computer Age Management Services (Cams) Ltd and Karvy Computershare Ltd—two of the largest mutual fund (mutual fund) industry’s registrar and transfer agents— every day at about noon, in South Mumbai and at a distance of 27km, submit the investment applications as well as pick up new forms and then return to Vashi at about 5pm. 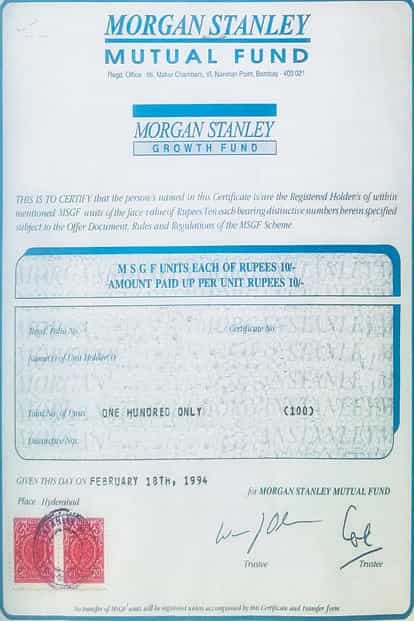 A 1994 Morgan Stanley mutual fund unit certificate. One winter evening, Khatri got a visitor who inquired about “some mutual fund scheme" launched by an innocuous fund house by the name of Kothari Pioneer. Since Khatri’s office boy had already left for Vashi by then, Khatri decided to drive down to Kothari Pioneer’s office himself. By the time he reached Kothari Pioneer’s office in South Mumbai it was about 7pm. There was one employee still there. Khatri was a beginner back then and remembers the employee being a bit hesitant to give away forms. Just then, a young man rushed out to inquire what was going on. After hearing about his long journey, the man ordered his employee to “get the forms immediately." That young man was Reddy. Over time, Kothari Pioneer mutual fund changed hands. In July 2002, Templeton Asset Management acquired Pioneer ITI Asset Management Co Ltd (Kothari Pioneer’s name had changed by then) to become third largest mutual fund in India after UTI and Prudential ICIC AMC. Franklin India Bluechip Fund (earlier Kothari Pioneer Bluechip Fund) has grown to ₹ 8,108 crore and Franklin India Prima Fund (earlier Kothari Pioneer Prima Fund) is worth ₹ 6,617 crore. Simply put, ₹ 10,000 invested in Bluechip Fund at its inception (November 1993) would be around ₹ 11.12 lakh now. Similarly, ₹ 10,000 invested in Prima Fund would be worth around ₹ 9.70 lakh now. Close to ₹ 7,500 crore flows into mutual funds every month as of July 2018 through SIPs Much of this has come in the past three years. But few investors and distributors saw the potential early on. Pune-based chartered account Shivaji Bhikaji Zaware, now 68, is one of them. Zaware was a teacher who taught accountancy. One of Zaware’s students, Bharat Phatak, had entered mutual fund distribution. Phatak was one of the early distributors to channelise their investor’s monies in debt funds when dividends from debt and equity funds were made tax free in Budget 1999. Up until then, Zaware used to invest in direct equities, UTI schemes and fixed deposits. “I was leading a very busy life even back then, so tracking my investments, especially my share investments, was becoming tough. mutual funds came along as a convenient vehicle for rational, long-term investments and I didn’t have to track them as minutely as I had to for my share investments," says Zaware. Since Zaware ran a coaching institute, he did not have a salary income and therefore his SIPs were few and far between. But he was an astute saver and invested regularly. Today, he gets driven about in a BMW car. His student Phatak, meanwhile, is 60 now and is one of India’s largest mutual fund distributors. eSmart investors and distributors in those days capitalised on debt funds. Ahmedabad-based Ashish Shah, a mutual fund distributor who set up shop in the mid-1990s, was one of them. In the 1990s, the long-term capital gains tax was just 10% for debt and equity funds and Shah saw an opportunity. A few months after Aditya Birla Sun Life Income Fund was launched in October 1995, Shah got one of his customers to invest ₹ 50 lakh. The corpus size was already ₹ 50 crore. “My customer was afraid to put money into debt funds. So, I told him to put 1% of the corpus, as there would be 100 other customers to fight if something goes wrong," says Shah. Today, Shah’s firm Wealth First is one of India’s largest mutual fund distributors managing a corpus of around ₹ 2,000 crore. Meanwhile, private sector fund houses had found their place. 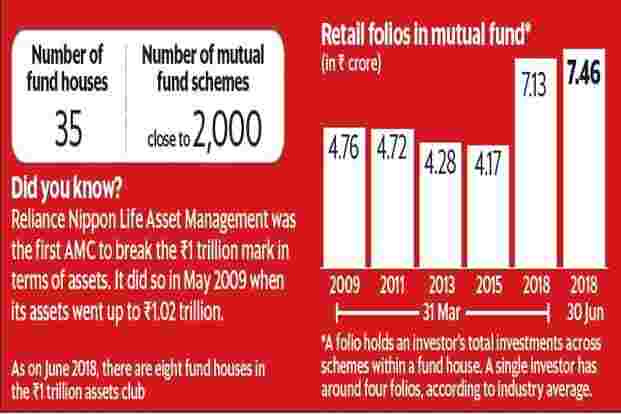 By 1 April 2001, 80% of inflows came into private sector mutual funds. By March 2001, 28% of the industry’s assets was with private sector mutual funds, up from just 10% by the end of March 1999. Navi Mumbai based Kiran Kamlekar Phanse, 60, decided to invest in mutual funds around this time. Since SIPs were yet to pick up then, he invested ₹ 5,000-10,000 in hybrid and debt funds. Phanse’s return over all these years: 13%. This was because he invested a lot in debt and hybrid funds. “Had he invested just in equity funds, he would have earned around 18-20% return," says Khatri, Phanse’s distributor. Phanse is retired now but still believes in investing in equity funds. “I don’t believe that retired people should not invest in equity fund because it is risky. Even at age 60, I like to take a bit of risk because I am financially stable, so I can afford to take some risks," he says. Meanwhile, equity funds returned around 20% over the past 15-year and 20-year time periods on an average, as per figures provided to us by Value Research. The growth of the industry and investors’ wealth creation wouldn’t have been possible had it not been for markets regulator Securities Exchange Board of India (Sebi) constant monitoring and tweaking of regulations. Although Sebi mutual fund guidelines were in place since 1992, they took a more formal shape in the form of a regulation in 1996. Ever since, the regulations have been consistently tightened. From prescribing norms on how to value securities (to ensure that mutual fund schemes reflect the true worth of their underlying securities; 2000), a detailed risk management system and investing in foreign securities (both in 2002), introduction of cut-off timings to determine which day’s NAV an investor gets at the time of buying and selling mutual fund units (2004), mutual funds became the most transparent saving instrument. But two rules shook the industry. In 2008 Sebi banned amortising new fund offer (NFO) expenses. Fund houses launched new schemes, spent about 6% of money they used to collect on heavy commissions to distributors and charged the scheme for the next five years. The NFO charge was as high as 6% in those days. The NFO culture got a further jolt when Sebi banned entry loads (2.25% at the time) in August 2009. Obituaries were written stating the mutual fund industry would collapse if distributors were not “adequately compensated." The reality turned out to be different. Distributors still get compensated, though under a much stricter regime, but their earnings have gone up. Ever since commissions were made public, they have gone up at an aggregate level. In 2013-14, the 50 largest distributors earned a commission of ₹ 1,961 crore. In 2017-18, this figure was ₹ 6,249 crore, according to Prime Mutual Fund Database. With a record high monthly inflow (through SIP) of little over ₹ 7,500 crore a month and an industry size of ₹ 23 trillion (the industry’s size in August 2009 when entry loads were banned was ₹ 7.5 trillion), the industry is clearly looking ahead.